It’s not exactly been radio silence, but since the end of 2012, my voice has been heard only intermittently speaking into a microphone. (Thanks to benevolent producers I’ve known for many years at Front Row and The Film Programme on Radio 4, I have enjoyed occasional short bursts of public address in the interim.) 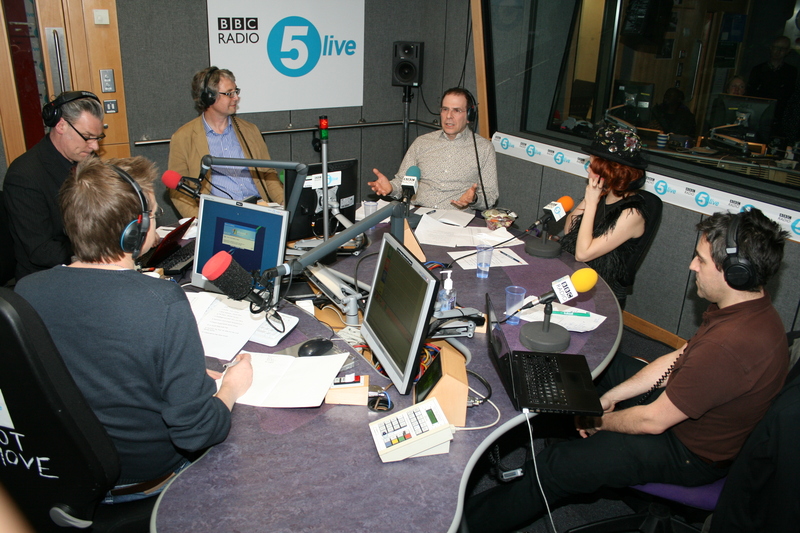 Above is one of the last Zelig photos I had taken for my collection when I was deputising on the 6 Music breakfast show and welcomed my transatlantic friend Harry Shearer onto the air in the latter half of 2012, with Matt Everitt standing by. It was fun while it lasted, but the two-year break has allowed me to indulge my insane ambitions to concentrate on scriptwriting, so I’ve been grateful for that. As someone whose twin loves are and always have been music and cinema, and whose natural way-in to classical music has been through orchestral film soundtracks, this is my dream gig. I’ve listened to the show with Howard at the helm, and its mix of populism and intelligent dissection works a treat. Classic FM is a commercial station (part of the Global group, which also includes Capital, Heart, Smooth and XFM), and it seeks to entertain as well as inform. As a relative layperson when it comes to classical, I often tune into Radio 3 and find it a little forbidding and exclusive. Classic FM is the opposite, and I think I’ve found a perfect new home here. The idea of curating and “jocking” some great movie themes and perhaps lesser-known cues and overtures from a century of cinema, and enthusing about them in between, thrills me to the bone. After a sabbatical, even more so. Continuity arrives in the form of John Barry, whose Zulu theme (one of my all-time favourites with its foreboding timpani and wall of brass and strings), used to herald my arrival on 6 Music, by law, and may just feature in my first show for Classic FM, this Saturday at 5pm. It’s well over ten years since I last joined a new radio station, and the experience of being welcomed into the bosom of the Classic FM “family” has been warm. Having been in and out of the Leicester Square HQ to record some demos during the job-interview process, it was with some awe that I actually collected my electronic “dongle”-style pass yesterday, having been introduced to everybody who works there from the MD to marketing, and taken in to see the great John Suchet while he was playing a record on-air. Having worked predominantly for the BBC over my 20 years in broadcasting, it was a shock, but not an unpleasant one, to be introduced to a dedicated team of people who all seemed to have definable jobs. As I commented to John, as I now call him, it’s all muscle and no flab in commercial radio. Wish me luck. It’s a big new adventure. There will be no Cud, but there might be some There Will Be Blood. We already have plans, my new producer and I, to rustle up a disaster movie special, and perhaps a show revolving around music from comedy films. I will get Clint Mansell into a future show, too. Along with Eric Rogers and Philip Glass. Maybe in the same show. And God bless them for using this “classic” picture to advertise my arrival on the Classic FM website. Cue the old joke: who’s that woman with the new presenter of Saturday Night At The Movies? Well, not angry, exactly, but animated and exercised and passionate about whether the music from You Only Live Twice is better than the music from Goldfinger or not. (It is.) On Friday March 18, I was invited by BBC Radio 5 Live to join a jury charged with selecting the Top 10 instrumental film scores of all time for a forthcoming concert by the BBC Philharmonic Orchestra, whose running order would be based upon our hard-fought selection. It’s all part of BBC Philharmonic Presents … a week of concerts themed around the proclivities of various BBC radio networks [find out all about it here]. 5 Live’s was chosen to be film-themed, and goes out live in two Fridays’ time, June 10, from 2pm, curated and presented by its cult film-reviewing/bickering duo Simon Mayo and Mark Kermode, whose “Wittertainment” initiative has defied nature and survived Simon’s move to Radio 2 (it remained in place on a Friday afternoon on 5 Live, which shows just how valued it is by the Beeb). The idea of these concerts is to officially launch the BBC’s new Salford Quays home, MediaCityUK, which has a venue built in. I wish I was going up to Manchester for the gig, but I am too busy. Should be a fine afternoon’s “instrutainment”. Tune in. You can see us all gathered around the warm glow of a green studio light that bright Friday afternoon, a jury of six charged with the ludicrous task of stacking up a dozen great orchestral film scores. 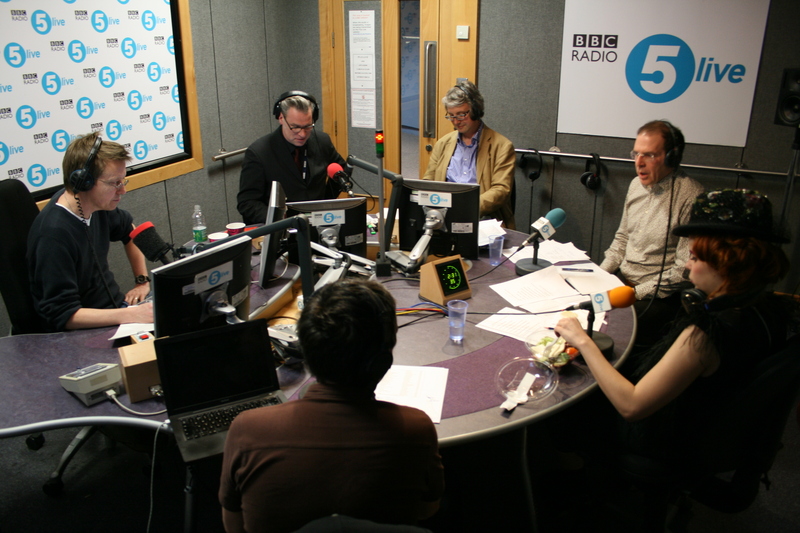 From left, then: Mark Kermode, the good doctor, linchpin of the Corporation’s film coverage and – as luck would have it – a skiffle musician in his own right; chairman, the genial Simon Mayo, and Mark’s unofficial handler; the Philharmonic’s General Manager Richard Wigley (who’d just flown back, with the band, from Japan, when the earthquake hit – if you want airlifting out of a stricken country, be connected to the BBC! ); eminent and garrulous American conductor Robert Ziegler, who actually conducted one of our shortlist, and about which he was extremely humble and gracious, There Will Be Blood; colourful, platinum-selling pop singer and actress Paloma Faith, the only jury member to dress up and wear a massive hat for the occasion as if it was on TV (unless she always looks like that, or was on her way somewhere else); and me. I had my laptop out because I’d forgotten to print off my own personal shortlist. The final shortlist of 11 (don’t ask) – heavily influenced, it must be said, by Richard Wigley’s valuable input on the sheer practicality/impracticality of an orchestra actually playing the extracts on the night/afternoon, and by our collective aim of not putting any composer in twice (except for John Barry, because we couldn’t help it!) – included Raiders Of The Lost Ark, You Only Live Twice, Blue Velvet (or at least a specific song by Angelo Badalamenti from it, Mysteries Of Love), Star Trek: The Motion Picture, Taxi Driver, The Mission (specifically Gabriel’s Oboe), The Godfather (one of my picks, although not exactly difficult to pitch), The Magnificent Seven, Midnight Cowboy, There Will Be Blood, and last but not least, 2046, which Paloma championed from the start as her absolute, foot-stamping must-have, a score from a still fairly obscure Wong Kar-Wai sci-fi love story by Shigeru Umebayashi, who, if he knows he made the shortlist, would be pretty surprised, I should imagine. A funny, odd and mostly enjoyable way to spend an hour, and democracy in action. Hey, it’s the only way I’m going to get back into that 5 Live studio on a Friday afternoon.